Every bull dreams of going to the bullfights. They know they will be the one to beat the matador and be a champion. Every bull, that is, except for Ferdinand (Colin H. Murphy, John Cena). Ferdinand would rather enjoy the lone flower growing in the pen he shares with the other young bulls. Valiente (Jack Gore, Bobby Cannavale), Guapo (Jet Jurgensmeyer, Peyton Manning), and Bones (Nile Diaz, Anthony Anderson) tease Ferdinand mercilessly for not being like the other bulls. One day, Ferdinand escapes the pen he is kept in and runs from the owners of the bull ranch. A young girl named Nina (Julia Scarpa Saldanha, Lily Day) finds Ferdinand and keeps him as a pet. With Nina, he is free to roam the countryside, smelling all the flowers he wants. As he grows, he and Nina are closer than ever. When he tries to sneak to the flower festival with Nina and her father, things don’t turn out well. Ferdinand is captured and returned to the ranch where he grew up. The other bulls, now ready to go to the bullfight, aren’t very forgiving. With El Primero (Miguel Ángel Silvestre) preparing for his final fight, he comes to the ranch to select the best bull to use in his finale. As the bulls vie for the chance, Ferdinand makes a grave discovery. His only hope is to get all the bulls on board so they can escape. Ferdinand takes a cute and funny story and wraps it around a message of accepting others, even if they are different. In the vein of Dwayne Johnson, John Cena is slowly shedding his wrestler image for a more family friendly one. First it was Daddy’s Home 2, where he plays a dad getting more connected with his daughter. Now we have him showing that a tough guy, namely a bull, can have a softer side, and that is okay. While it is only voice acting in this role, he seems to really take to it, not shying away from showing his gentleness. Kate McKinnon provides the majority of the comic relief of the film. Being the resident comedy expert, McKinnon doesn’t disappoint as a “calming goat” that isn’t very calming. The rest of the cast performs well, filling their roles with what are more typical roles for the actor. While the characters aren’t as cute and lovable as we normally see in animated films, Ferdinand shows that even a bull can literally be cuddly given the right circumstances. I was worried the movie would gloss over the brutal reality of the bullfighting world. Towards the end of the film, however, it becomes the central theme of the movie and proper motivation for the bulls. The jokes and sight gags keep things light enough that it doesn’t become overwhelming. 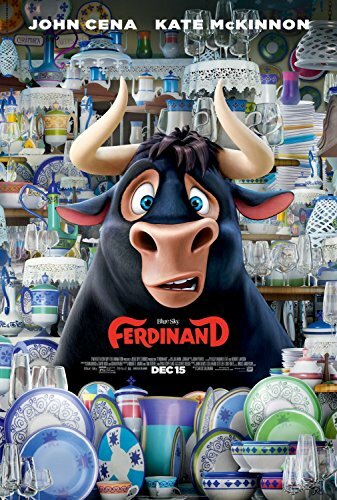 Ferdinand is a light-hearted, fun family film that everyone can enjoy. The cast is great and the story is funny enough that adults and kids will be entertained. There isn’t much competition right now for movies for kids, which makes Ferdinand an easy choice if you are looking to escape the cold with the kids.